It's not a common practice for an automaker to debut a convertible before its coupe counterpart, but that's exactly what BMW has done with its next-generation 6 Series. The droptop made its debut at the Detroit Auto Show earlier this month, and while the hardtop Sixer will be rolled out within the coming months, our spies have just captured the swoopy new coupe out in public completely undisguised. We're hardly surprised by the design of the new 6 Series Coupe - a fixed-roof version of the attractive new cabriolet that takes inspiration from the Concept 6 Series Coupe that debuted at the 2010 Paris Motor Show. Obviously, some of the concept's finer points (the large wheels, the large lower air intakes) have been softened for the production car, and what we're left with is a pretty sleek evolution of the big coupe's design. We fully expect powertrains to be carried over unchanged from the convertible, meaning a twin-turbocharged V8 packing 400 horsepower and 450 pound-feet of torque will be in store for the 650i coupe, mated to a choice of six-speed manual or eight-speed automatic transmissions. We haven't been given the official word on when the Big Six will officially debut, but we'd be shocked if the new coupe didn't turn up at the Geneva show in March. 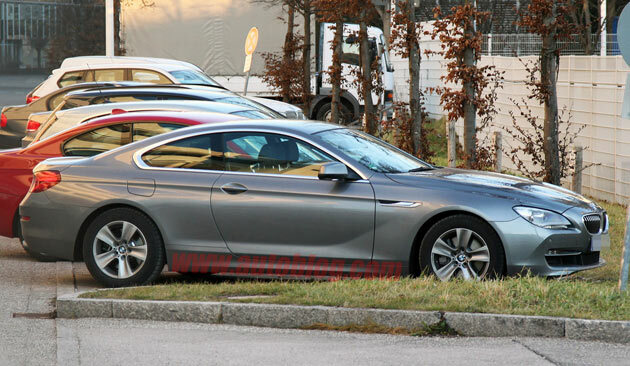 [source: CarPix]Spy Shots: 2012 BMW 6 Series Coupe caught without camouflage originally appeared on Autoblog on Mon, 17 Jan 2011 14:58:00 EST. Please see our terms for use of feeds.